Dive into the flow and explore the fluid intelligence of streaming wisdom. is a guide for wisdom seekers, social innovators, visionaries, CEOs, transformational leaders, facilitators, teachers, meditators, and others who wish to explore their stream of inner nature. Sometimes we are called to a deep inner place, where we know we must do the work of our soul, and follow the path that we are led upon, a path that runs deeper than any place where we have ever traversed during our earthly existence. In this place, we are invited to proceed with a deep inquiry into the very nature of our being, because nothing less than knowing who we are will suffice. We rush around in our busy world, disconnected from the root of who we are and why we are really here. Why rush, when you can lavish in the luxury of knowing your own self? * What answers are you seeking? * Is there a decision you are grappling with? * Are you feeling stuck? * Need help with a relationship, your health, or your career? * Do you fear a potential change in your life’s circumstances? Happiness, clarity, and peace of mind await you. "Tao, the Art of Flow" will illuminate your way"
Don’t be caught in the freeze frame of your life. will show you how to ride the current of your experience – whatever it may be – with excitement, rather than fear. Freedom is the ultimate goal on this journey; the freedom to know yourself and feed your soul of the riches beyond the temporal earthly plane. Go now. Be guided. Accept the fact whats powerfuly so in support who you are. And you are here, in this place, right here and now to receive the messages from your soul. When the outer world just won’t do anymore, come listen. Step inside. Hear the music, the sweetness of life as it unfolds before you. It’s your turn; it’s your time. Come, the adventure begins. It beckons you as a wave is beckoned to the shore. Dive in to Tao, the Art of Flow, learn the ancient secrets, and ride the waves to more peace, abundant joy, clearer knowing, and deeper wisdom in your life. Gift yourself or your loved ones. 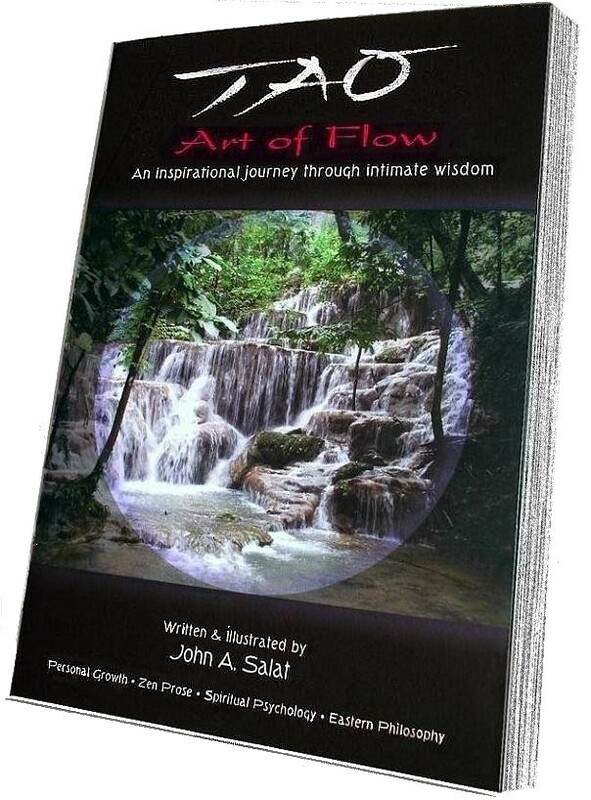 Order "Tao, Art of Flow"